This is an UV (Ultra Violet) edition of the Arc AAA. It features a Nichia NSPU510CS 375nm UV LED powered by a single AAA battery, it can use lithium, alkaline or nimh rechargeable AAA batteries 1.5v. The body is constructed from Type III Hard Anodized 6061 Aluminum and the interior is coated with chemkote for stronger corrosion reistance. The switch is a twisty at the head, twist the head for simple on-off activation, o-rings make the light water reistance up to a hundread feet. Runtime with an alkaline battery is about 5 hours to 50% power. 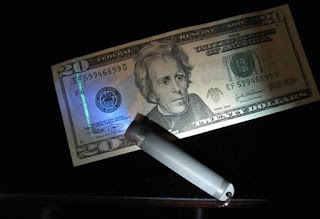 UV lights are useful in many applications where objects need UV wavelengths to flouresce, like detecting counterfeit, scorpions, body fluids and others. Exposure to UV light is potentially harmful to the eyes so this is not a light to play. If you need a keychain UV light the Arc is probably one of the most durable versions you can get it will last forever in your keychain. If you don't need a very rugged light you have several options much cheaper and with similar runtime and output so this one probably makes sense only for those that use an UV light every day. You can get it for $40 at ArcFlashlights. The Maratac responder bag is a pouch that can be used to carry medium sized EDC kits. The interior size is 7'' by 12''. One side has three velcro strips that can be used to attach accesory pockets or just strap your EDC items to the pouch interior. The other side feature three large pockets: 6.5'' by 6.5'', then 8.25'' x 6.5'' and the third one 9.5'' x 6.5''. This side has elastic loops for pens and other EDC items and a button loop that can be used for a split ring or other small EDC items. At the center you have a elastic loop that is perfect for a small or medium sized flashlight. The pouch is made of strong nylon and has a zipper that runs very well all along the pouch. In the exterior you have several MOLLE compatible attachment loops that can be used to add addditional pouches to this one or to just attach with carabiners or similar other EDC items to the kit. 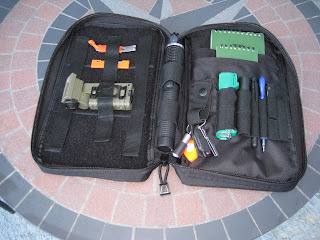 This is a very interesting pouch for medium sized kits because it is really designed for EDC items, you can fit your flashlight, pens, knife, notepads and other small items without having them loose in the interior it is very versatile and can be adapted to several kits. Because of its size you will have to carry it inside a backpack or a larger pouch. You can get it for $19 from CountyComm.